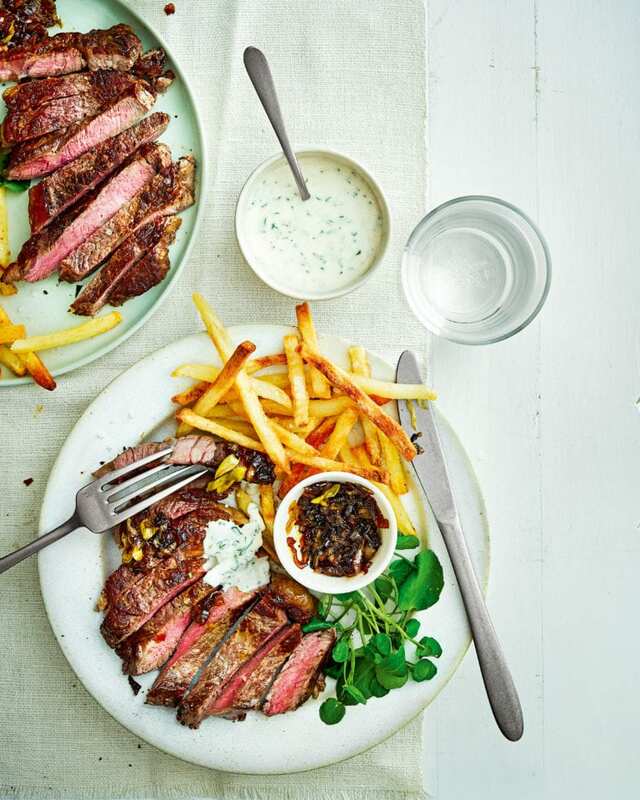 Succulent steak accompanied by a three-onion relish and fries makes an indulgent but fuss-free Friday night meal for two. Heat a splash of olive oil in a large frying pan over a medium-high heat. Season the steaks with salt and pepper, add to the pan and cook for 3 minutes on each side for medium-rare (or until done to your liking). Set aside to rest. Meanwhile, in a separate pan, fry the shallot and spring onions on a medium heat with a splash of oil for 5 minutes until beginning to brown. When the steaks are resting, transfer the onion mixture to the steak pan along with the garlic and rosemary. Add the relish and use a wooden spoon to scrape up any brown bits from the bottom of the pan. Mix the yogurt and herbs with the resting juices from the steak, season well, then serve with the steaks, onion relish, watercress and fries, if you like.